We owe it to our students to bring what interests them into our classrooms. If your students are like mine, that means embracing video games by implementing game-based learning. 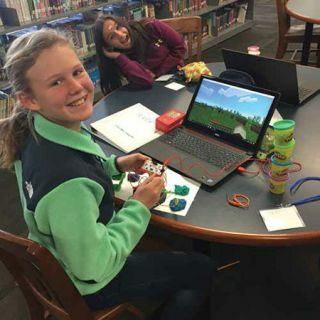 Game-based learning lets students have fun while they gain or improve various skills. I fused game-based learning for the first time during the 2014-15 school year. I’d challenged my students to create presentations, without using Google Slides, that demonstrated what they’d learned about Romeo and Juliet. Many of them created videos, but one student asked if he could use Minecraft. Although I’d never heard of Minecraft, after he explained that it’s an 8-bit-looking video game that enables players to build anything out of blocks, I decided to let him try it. A week later, he brought his laptop in and walked his classmates and me through his 1:20-scale Globe Theatre and the different scenes of the play he’d built on the stage. My kids were so excited by what he’d done that, in the next round of presentations the following week, other students also used Minecraft to show what they’d learned. I’ve used game-based learning ever since—either to drive home points or to allow students to show me what they’ve learned. Video games in school aren’t new. I remember racing to finish my work when I was in fourth grade so I could play Where in the World Is Carmen Sandiego? or The Oregon Trail. What is new is using games as a teaching tool rather than as a carrot dangled in front of students to encourage compliance. Game-based learning involves using video games for teaching or assessment. Instead of offering games as something students can do after they’re finished working, teachers incorporate games into lessons to help students learn key concepts through a medium that they love. Here are five tips and 11 games you can use to get started using game-based learning in your classroom. 1. Games shouldn’t replace instruction. Whether you start with a game to hook students or use a game to allow students to apply new knowledge, don’t forget to provide clear instruction as to what they should have learned. It’s also important to provide time for students to debrief and reflect on how the game helped them to deepen their understanding of the topic. 2. Don’t be afraid to use the games students play at home. My most successful, engaging lessons have involved the AAA games (those with the highest development and marketing budgets) students race home to play. Even controversial games like Assassin’s Creed and World of Warcraft have made brief, targeted appearances in my high-school classroom—to the delight of students. 3. You don’t have to be an expert or a gamer to use game-based learning. Let your students be the experts. Ask students and listen to find out about the games they’re playing and how they might be incorporated into your classroom. This is how a friend of mine started using FIFA and Madden to teach statistics. 4. Harness the power of social media. Game-based learning can be expensive, but it doesn’t have to be. Most of the games I use in the classroom have been donated by the companies that make them. Reach out on social media and let them know how you want to use their games in your teaching. Many video game companies are generous when it comes to schools and would love to support your classroom. 5. Analog games are part of game-based learning too. Game-based learning doesn’t always have to include digital games. My favorite assessment activity is to task my students with creating a board game that captures what they’ve learned during a unit. Creating, and then playing, games is a great way to integrate art and other valuable skills into your classroom. Instead of seeing video games as enemies of learning, try harnessing the power of what your students love and enjoy by bringing games into the classroom. Integrating game-based learning into your lessons can engage students and help them apply and share what they’ve learned in new ways. Chris Aviles is the EdTech Coach at Fair Haven schools in NJ. He is also the author of The Gamification Guide. Follow him on Twitter@TechedUpTeacher. The Walking Dead. Based on the popular TV show, The Walking Dead video game by Telltale Games can be used to teach ethics, morality, and decision making, and it’s also fantastic for teaching story structure. Minecraft: Education Edition. Minecraft is my favorite video game for teaching. Minecraft: Education Edition is an open-world sandbox game. Using blocks, students can build anything they can dream up—by themselves or with a group. Sumdog. These browser-based math games target important skills and produce progress reports that help you track student success. Legends of Learning. Similar to Sumdog, Legends of Learning is a browser-based suite of curriculum-aligned middle-school science games. Offworld Trading Company. Science fiction meets the stock market—Offworld Trading Company is a great way to get kids thinking about supply and demand, the stock market, and other business concepts. Bloxels. With this hands-on platform, kids can build, collaborate, and tell stories through video game creation. Cities: Skylines. SimCity on steroids, Cities: Skylines is a city-building simulator that encourages students to think through the complicated decisions a civil engineer needs to make. Civilization VI. Students learn about a variety of historical civilizations as they try to dominate the world through different victory conditions. SiLAS. Players control avatars and act out social scenes to improve their social/emotional learning. Portal 2. This famous puzzled-based game is great for teaching growth mindset, problem solving, and teamwork. Portal 2 also comes with a test chamber that allows students to make their own puzzles and challenge friends. DragonBox. DragonBox is a series of highly regarded math apps that will help improve students’ basic math skills all the way through algebra.